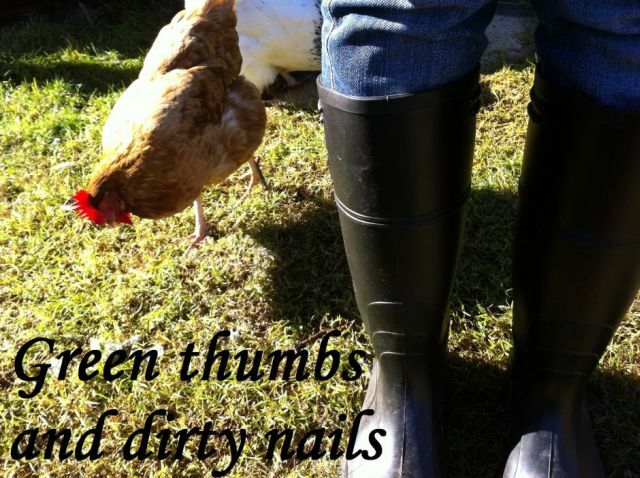 Green thumbs and dirty nails...: She's nesting. Just over three weeks ago, I went to collect one of Cambridge's eggs, and discovered the egg was sitting in what appeared to be a nest. I hesitated, remembering back to what I had read online regarding Indian Runner Ducks and nesting. All written sources advised that this breed of duck lays on the run, hardly ever sits on their eggs, and if they do, won't stay on them for the duration of the incubation period. I decided to leave the egg in place and let her try. Over the past three weeks Cambridge has been a perfect mother. She has built herself a warm, cosy and safe nest up close against the base of the banana tree. Cambridge sits on the eggs most of the day, and only leaves them for food, water and a little bit of exercise. As she prepares to get off the eggs we watch her pull the surrounding straw towards her with her beak, and covers the eggs with the straw as she gets up. This keeps the eggs nice and warm while she is away from them. As the hatch day nears, we thought we should move their nesting box closer so she has somewhere safer to take her babies if she needs to (remember the nesting box I built that the ducks never used?). I new I had the perfect way to tempt her and Oxford away from her eggs. Shell pool!!! While her and Oxford splashed around, I made some coop modifications. I had to remove this tree from the coop as it was in the space I needed to put the nesting box. Jamie offered me a saw to chop it down, but I just snapped it clean off with my foot (#farminglife). Can you spot her up there behind the banana tree trunk? 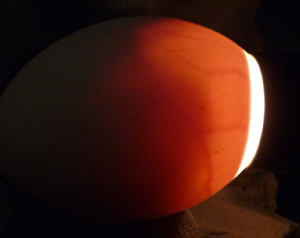 Yesterday evening Jamie and I held a torch up behind one of the eggs (candling), and we could see all sorts of dark shapes - oh!!! - I think there is a duckling inside!!! We saw something very similar to this, so by our calculations we think they should hatch by this weekend! How exciting!! Be sure to update us on any nesting progress! that's so exciting! i love duckings! i'd really love to have a couple of ducks. If you have the space they are seriously the best! They eat all the bad bugs from your garden but not your veggies, so it is definitely a win-win!